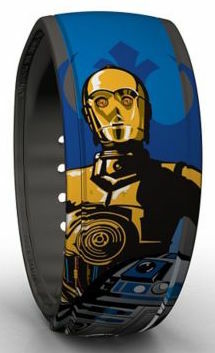 Today a new Star Wars Droids MagicBand has been released for sale, which features the characters of R2-D2 and C-3PO. 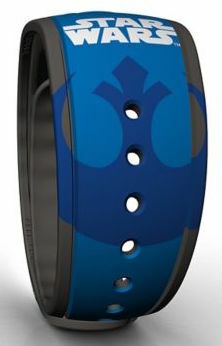 This band has a very similar appearance to a Droids band that you can get at some of the MagicBand On Demand stations. Seen in the Shop Disney Parks mobile app, you can buy this band immediately and have it shipped to you, or you can wait for it to appear in the Walt Disney World theme parks. This is an Open Edition band, will cost $22.95, and it won’t make any special lights/sounds at FastPass+ touch points. Owner and founder of MagicBand Collectors, it is my goal to catalog and archive the entire history of the Disney MagicBand. I don't work for Disney nor am I associated with them in any way, besides being a mega-fan and living 5 minutes from Walt Disney World with my wife and two kids. You can contact me at ethanwa@me.com. 8 Responses to "A new Star Wars Droids MagicBand has been released, featuring R2-D2 and C-3PO"
How do you know when a Magicband has a special light or sound when scanned? Can you see it on the box ? Only Limited Edition bands (that cost $32.99) make lights and sounds and come in a special square box. All other bands don’t do those special effects. Yes, just look in the Shop Disney Parks apps, it has a map that shows you were each MagicBand is located in Walt Disney World. Lol … I can’t get the app. I’m European ? Oh sorry I didn’t realize you couldn’t even download it. In that case, look in Mouse Gears at Epcot when you get here. They tend to have the best selection of MagicBands. I must say that having a LE magicband is cool because every time I enter park or do fastpass/photopass cast members and guests always love it. I have the LE Halloween party band 2015, it has a wolf howling and lights up all colors.